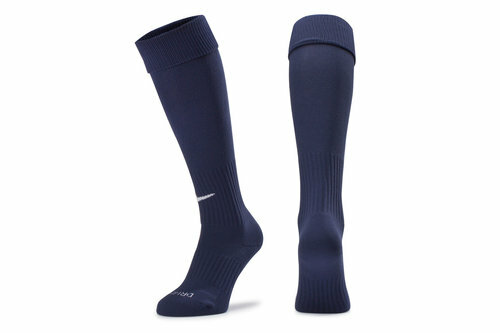 Ready for action in matches and in training, add to your kit bag these essential Nike Classic II Football Socks in Midnight Navy Blue. These Nike football socks have a plain and simple design that features the famous Swoosh on them and are ideal for casual and competitive play. Made from nylon and elastane, medium density cushioning ups the comfort levels whilst arch compression offers a supportive fit. Nike Dri-Fit technology is also included within the fabric of the Nike Classic football socks to help keep the wearer's feet feeling cooler, drier and more refreshed by wicking sweat away from the skin and quickly drying off. With a left and right specific design for an improved fit and reinforced heel and toe areas to enhance durability, these socks deliver a quality performance all season.